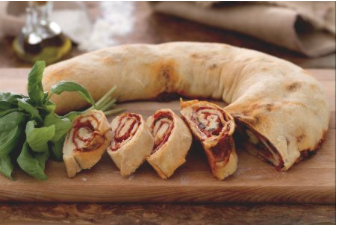 The rolled up pizza, also known as pizza Stromboli is not a traditional Italian recipe but comes from the USA. 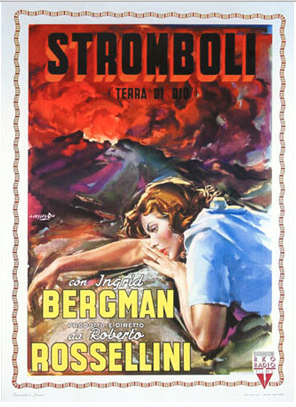 It was created during the 50’s in Philadelphia when the cinema world was rocked by actor Ingrid Bergman and Italian director Roberto Rossellini’s love story. The two fell in love during the making of the film Stromboli, on the Sicilian island and their relationship was as explosive as the volcano and the taste of this pizza. In a bowl pour the warm water, add the salt and mix. Add the oil and mix again. Set aside. In a bigger bowl sieve the flour and add the dry yeast. Pour in part of the liquid and honey. Start to knead by hand adding the rest of the liquid bit by bit, depending on the type of flour you are using you may need to add more water. Keep kneading until you have a soft, elastic but substantial dough which you will shape into a ball and put to rise into a large bowl dusted with flour (remember that the dough will rise as much as twice its volume). Cover the bowl with cling film and set aside in a warm corner away from drafts. Wait until the dough has risen fully (around a couple of hours). Prepare the ingredients for the filling: pour the tomato passata into a bowl, season with salt and origano, add a tablespoon of olive oil. Cut the olives in round slices and the anchovies in half. Drain the mozzarella and cut in small cubes. Drain the capers from the vinegar or wash the salted ones under water and drain. Heat up the oven to 180° (160° if fan oven). Take the dough and roll it out over a wooden surface dusted with flour in a rectangular shape 50 x 45 cm. Cover with tomato passata making sure you leave a 2cm border all round. Lay out the anchovies and salami, capers, olives and mozzarella. Brush the border with little water so that the dough will stick together when you roll it. Finish off the filling by adding some fresh basil leaves. Roll up the dough along the longer side and seal the ends tightly. Shape the roll in a U shape and carefully move it onto an oven tray which has been covered with baking paper. Brush the dough with olive oil and bake in the oven for 1 hour (50 minutes in fan oven). Once the pizza is ready cut it into slices and serve hot.